added support MS Access 2016. added IsMsAccess property. if set to true, it can use on Ms Access 2016.
added CameraFocus object, let control Focus in C# or VB.NET. fixed Brightness, BacklightCompensation, ColorEnable, Contrast, Saturation, Sharpness, WhiteBalance Object cannot set Auto = true issue. fixed Brightness, BacklightCompensation, ColorEnable, Contrast, Saturation, Sharpness, WhiteBalance Object cannot get Auto property correctly. added High DPI support on Windows 10 . Fixed If usere selected Windows Display setting, select Scale and layout from 100% to 125%,150% or another scale ratio on windows 10. The video preview windows will not display full size issue. added use the Video Mixing Renderer 9 automatically. If it cannot use Video Mixing Renderer 9 , it will use old video renderer. fixed save to avi file, then cannot save to wmv video issue. added Ms Access 2016 DatabasePreview.accdb ,DatabaseMP4Encoder.accdb and DatabaseIPCamera.accdb samples. updated VB.NET 2010, VB.NET 2015 ,C# 2010, C# 2015 CameraControl samples. fixed rebuild the project in C# or VB.NET , it will crash on IDE. 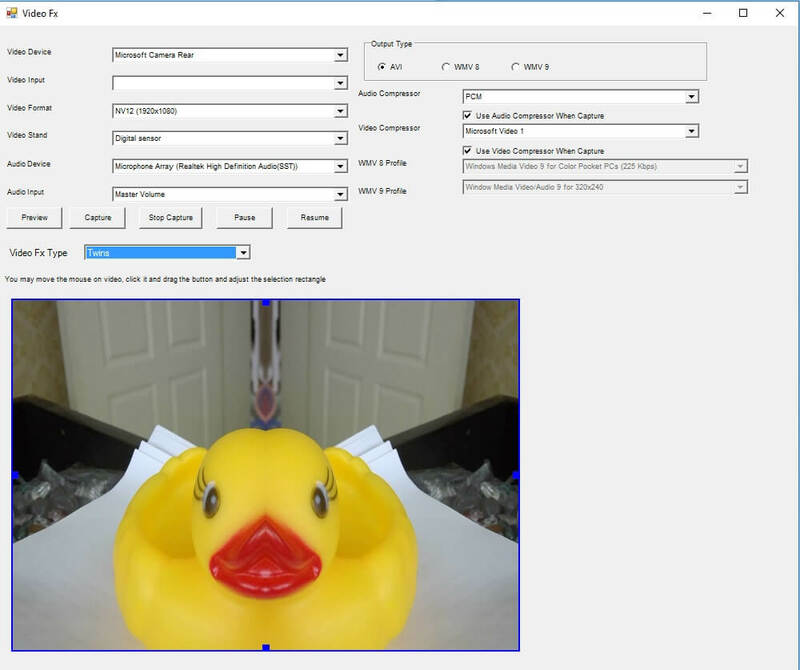 updated C#2010 IP Camera sample. rewrite IP Camera engine, it support more IP camera. Improves speed and accuracy for IP Camera feature. added support Listen to live audio from IP camera. added record the streams of IP Camera to a AVI. MP4 file without video transcoding. fixed if webcam have stillpin and set CustomVideoCard= true, preview black window issue. 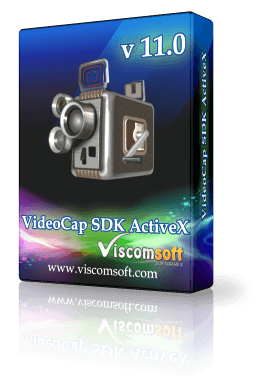 fixed VirtualScreenCaptureArea method that cannot change the specific capture area when selected virtual screen capture as video source. updated all VB6 samples, fixed MSCOMCTL.OCX could not be load failed error message. 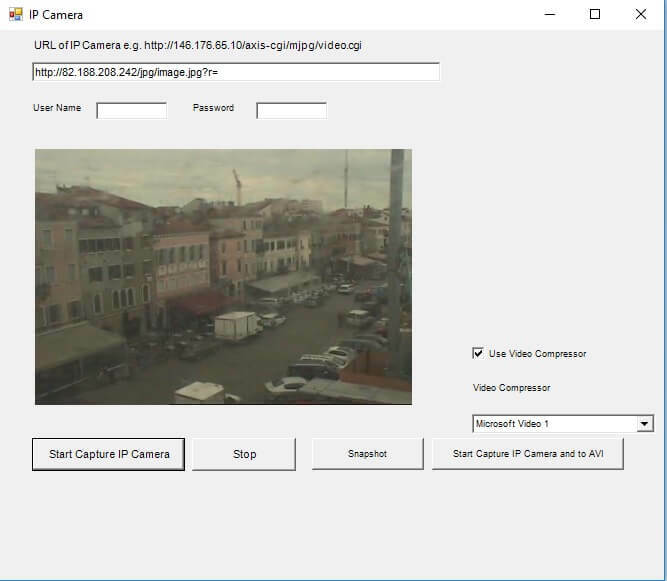 updated VB6, VB.NET 2010, VB.NET 2015, C# 2010, C#2015 VC IP Camera sample. added support scrolling banner text effect. custom define scrolling direction, font name, font size, background color, text color, alpha value and fade edge effect. fixed IP camera display active movie window. added support 90-degree rotation and 270-degree rotation with stretch mode in Rotate method. Restore CaptureAudio property feature same as version 9.5, it will not listen to the audio when preview, because when capturing to video, the customer may not like listen the audio from speaker and added PreviewCaptureAudio property, set this property to true it will listen to the audio when preview. added EffectScrollTextDirection, EffectScrollTextFillBgColor, EffectScrollTextSpeed, EffectScrollTextSpeed proeprties. added EffectScrollTextAdd, EffectScrollTextBgColor, EffectScrollTextColor, EffectScrollFadeEdge, EffectScrollTextFont, EffectScrollTextPos methods. added VB6, VB.NET 2010, VB.NET 2015, VC Scrolling Banner samples. added Chroma Key plugin, it support Real Time Chroma Key effect for any video source or MP4, MOV video. e.g. foreground video is webcam, background video is MP4 video. 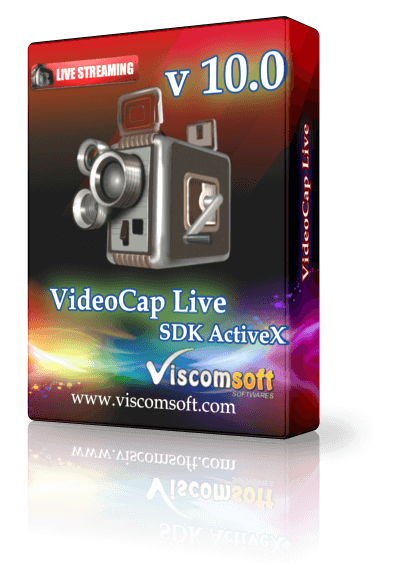 Capturing to AVI, WMV, MP4 video with Chroma Key effect in real time (output MP4 file, need purchased MP4 encoder plugin). Support use eye dropper to select the transparent color, adjust Tolerance and Edge softness for remove background (green color) completely and it can add real time effects, you may change the effects PNG files. added EffectChromaKeyBgColor, EffectChromaKeyCapAudioDevice, EffectChromaKeyDisplayMask, EffectChromaKeyEffect, EffectChromaKeyFreezeOverlay,EffectChromaKeyKeepLastFrame, EffectChromaKeyOverlayScale, EffectChromaKeyOverlayX, EffectChromaKeyOverlayY, EffectChromaKeySoftness, EffectChromaKeyTolerance, EffectChromaKeyVideoFile, EffectChromaKeyVideoIsBg properties. added PIPFastMode property, it can decrease the CPU usage. added InitControl method. fixed some development tools (Agilent VEE Pro,it looks like labview) cannot initialize the control automatically. added VB.NET 2015, VB.NET 2010, C# 2015, C# 2010, VB6, VC , VFP ChromaKey samples. added iSecond, iOnedecimalplace parameter in Capturing event, now when capturing, you will know the duration of captured video. added set the CaptureAudio property = true , it can listen to the audio when preview. For old version it cannot listen to the audio when preview. now you may set CaptureAudio property to enable/disable listen to the audio when preview. added VirtualScreenShowMouseHighlight method , it allow enable or disable mouse highlight features with virtual screen capture. updated VB6, C# 2010, VB.NET 2010, VC 6 CaptureFileMP4Encoder samples. added support snapshot from Still Pin and get HD snapshot image. (If your webcam or camera support capture HD image from a Still Pin). added support Enumerate Still Pin Video Formats. (If your webcam or camera support capture HD image from a Still Pin). added CameraFocus object, fixed Focus object cannot use issue, For some development tools, e.g. VB.NET, C#, Focus object cannot use because name conflict. fixed video resolution cannot changed and snapshot resolution cannot changed for some webcam e.g. Microsoft Camera Front, Microsoft Camera Rear. added anti-alias handle on Virtual Screen Capture Plugin. 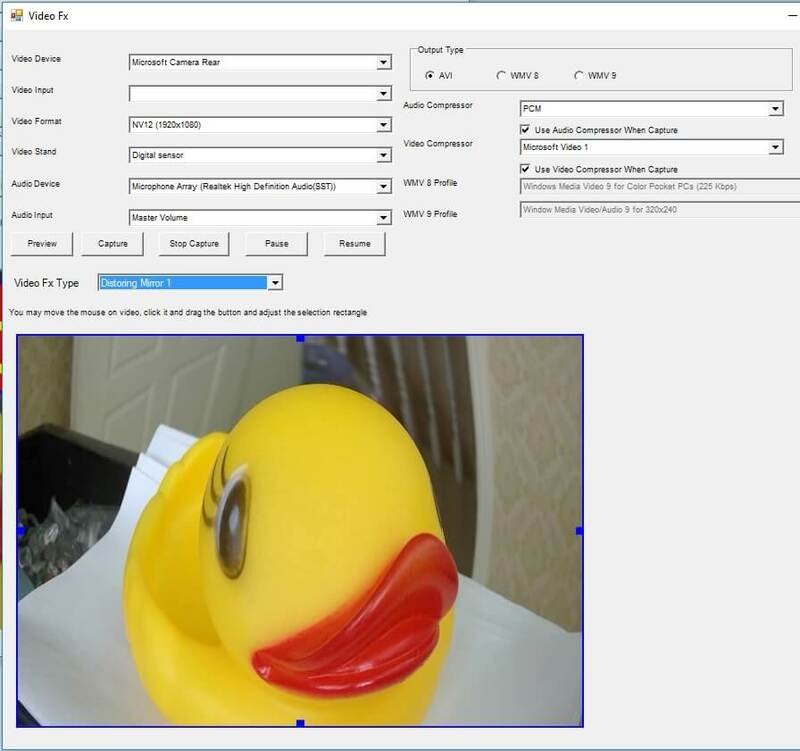 added StillPinVideoFormat, StillPinVideoFormats, CameraFocus Object. added Still Pin Snapshot feature in VB6, VC , VB.NET 2010\'s CaptureFile samples. updated VB.NET 2010, VB.NET 2015 Snapshot sample. fixed when preview or capture mode, the Click, DblClick, MouseMove, MouseDown, MouseUp events does not fired. fixed Microsoft Camera frame rate issue when save to avi file on windows 10.
updated Snapshot, SnapShotJPEG methods\'s memory issue. added checking the range of supported frame rates when set FrameRate property. added Mp4AspectRatio property, allow enable or disable aspect ratio when output MP4 video. added VB.NET 2015 , C# 2015 samples. added new Virtual Screen Capture plugin, it support Screen Capture with highlight color , left click effect, right click effect, custom cursor file and support capture full screen or part of screen and support multi-monitor screen capture. fixed DeviceChange event will fired two times on some web cam. 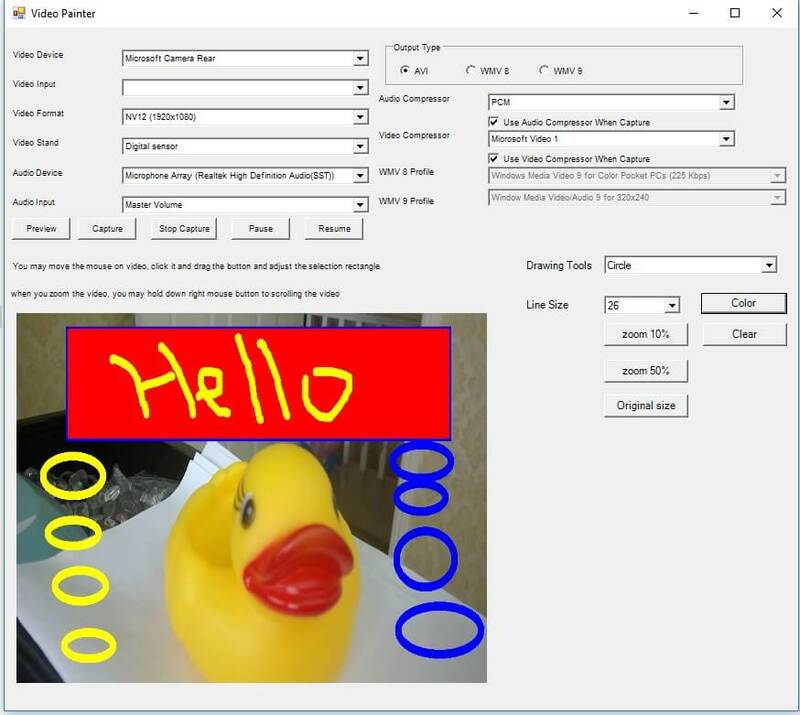 fixed if no any USB webcam connected and run your application. Then plug the USB WebCam, RefreshVideoDevice method cannot refresh the new WebCam issue. fixed save to AVI file first, then cannot save to WMV video issue. 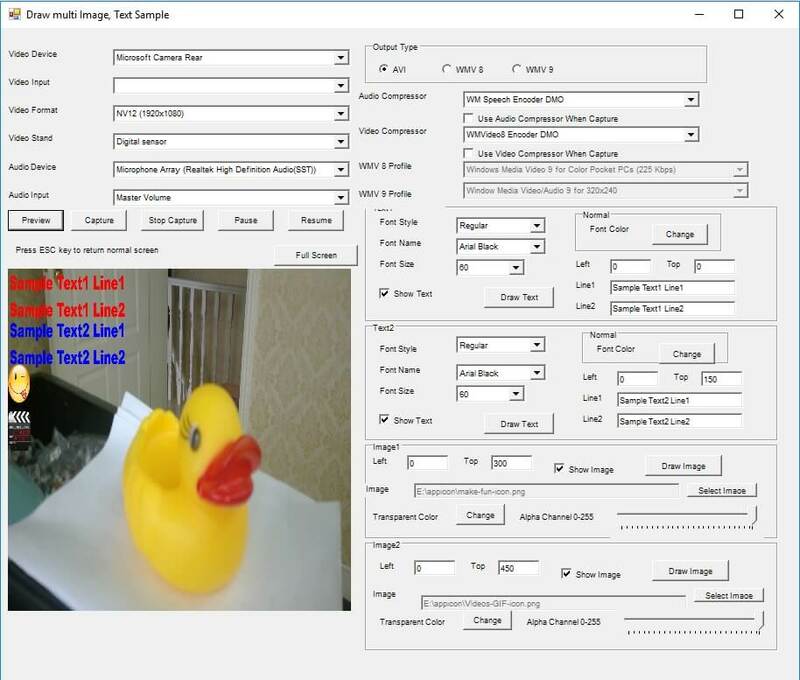 added VirtualScreenCursorFile, VirtualScreenShowSystemCursor, VirtualScreenRightClickColor, VirtualScreenLeftClickColor, VirtualScreenHighlightColor, VirtualScreenCaptureFullScreen methods. updated VB6, VB.NET 2010 VirtualScreen samples. rewrite MP4 Encoder plugin, now it can real time capturing to HD MP4 video on any windows OS. Fixed audio sync issue. Custom define MP4 resolution, Video/Audio Bitrate, Audio Sample rate, Audio Channels. added Mp4Album,Mp4Width,Mp4Height, Mp4FrameRate, Mp4Audiochannel,Mp4Author,Mp4Comment, Mp4Copyright, Mp4Title properties. updated VC , VB.Net 2010, C# 2010, VB6 samples. fixed crash issue in Visual Foxpro IDE. fixed properties are not displaying in design mode issue. updated VB6, VC camera control samples. 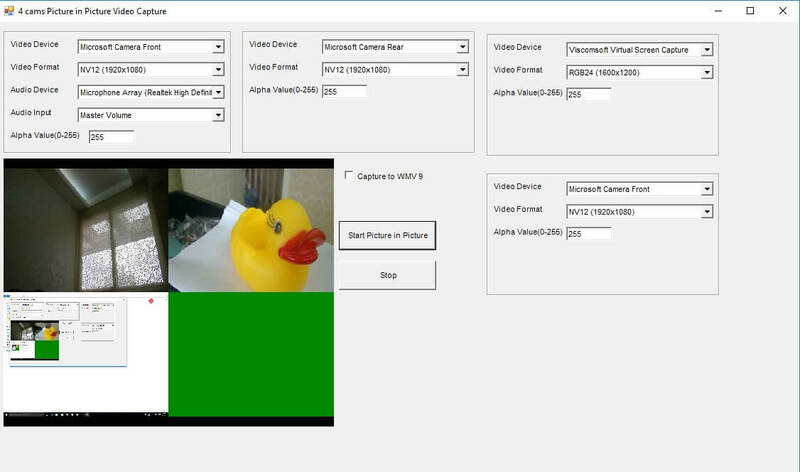 added Capture to MP4 vb6, c#2010, vb.net 2010 vc samples. 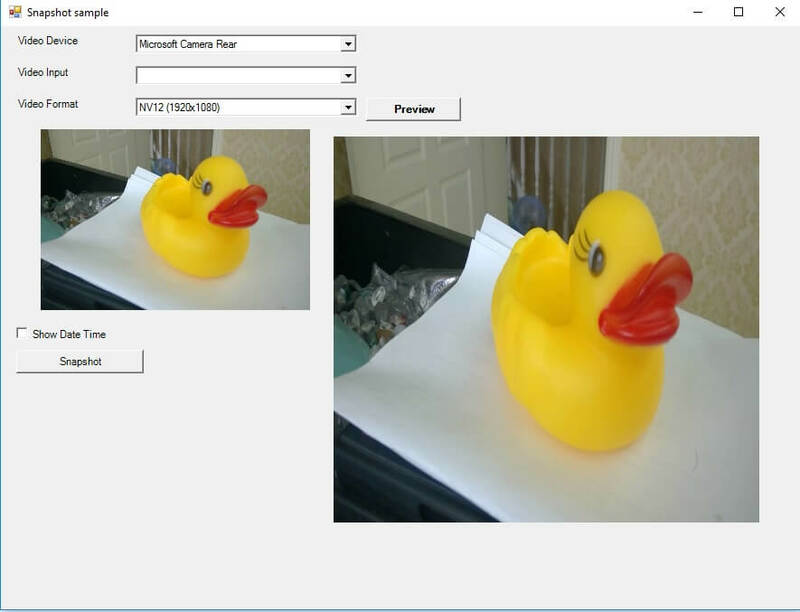 added vb6, vb.net 2010 4 Cams Picture in Picture effect samples. added vb6, vb.net 2010 virtual screen samples. 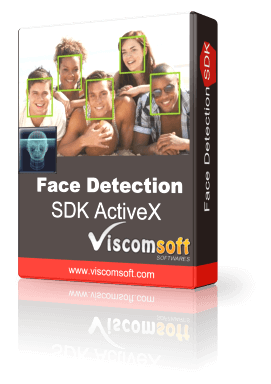 added vb6, vc , vb.net 2010 face detection samples. added UseOverlayInPlugin property, it Allow use Overlay Text, Overlay Image, Rotate, InvertColor, GrayScale, Hue, Lightness effect when using Video Fx, Video Painter, Motion Detection, Video Frame plugin in same time. 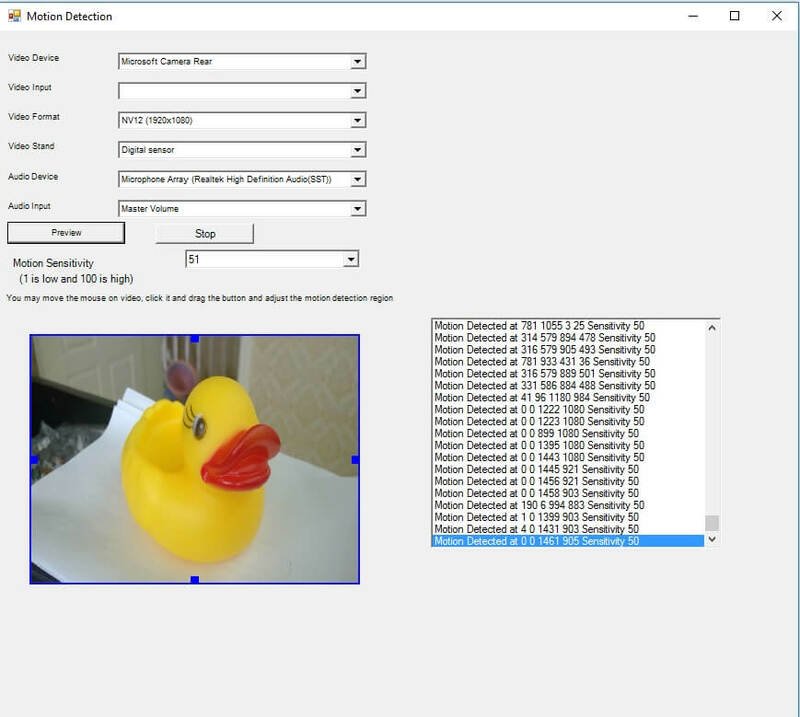 fixed crash issue on some comptuer when using Video Fx and Motion Detection. fixed cannot preview some Hauppauge WinTV capture card, e.g. WinTV-HVR-1600. updated crash issue in vb.net, c#, more stable on .net now. fixed crash issue when connect IP camera in some computer. added vb6, vb.net 2010, vc samples. fixed c#2010 and vb.net 2010 samples cannot run on 64 bit OS issue. fixed two same model of video device installed on system. if create two instance of activex , access different video device for each instance of activex, only one instance of activex can preview issue. added allow unload or close the video device. added allow add picture in picture effect, video capture device mixing image file or mixing two video capture devices. added allow apply moving effect, zoom in, zoom out effect at specific time on specific picture when using picture in picture effect. fixed display pure function call issued when using on .net. added c# 2010, vb.net 2010 samples. 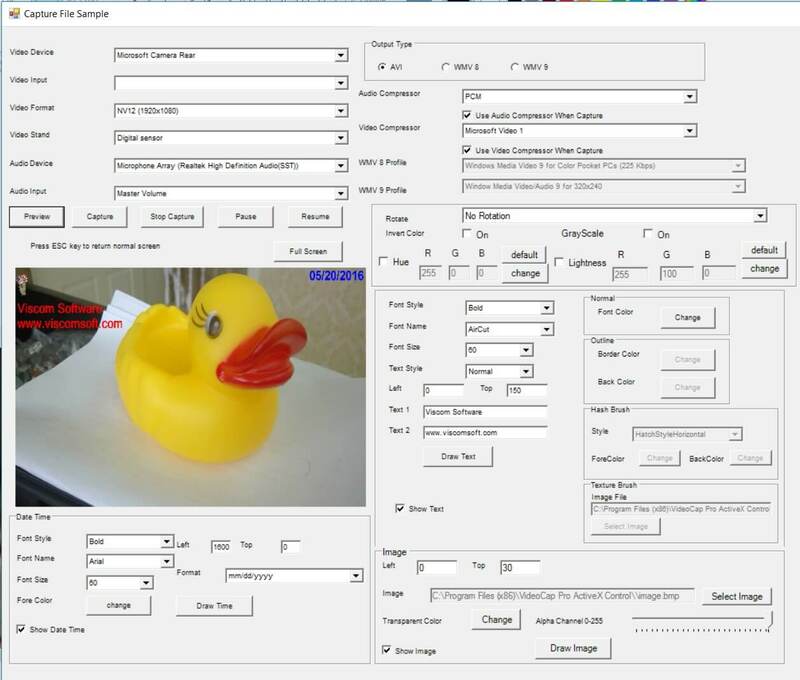 added PIPChangePos, PIPAddImage, PIPAddVideoDevice, PIPInitDisplayArea, PIPAddPIPEffect, PIPStart, PIPStop methods. 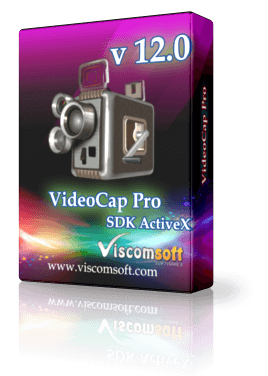 support capture the video to AVI file from IP camera. improved the sync issue when output avi, wmv file. added draw multi images and texts on video in same time. added Capture Video stream From IP Camerea. added Frame grabber to memory or clipboard. added Detecting insert or remove USB device. added Support FM Radio, AM Radio, Digital Satellite Service TV Tuner. fixed refresh video, audio device issue in.Net. added DrawImage method that support overlay bitmap. added restore audio pin when the control destory. modified DrawText method that provide over 50 different text styles. fixed snapshot can capture the text.